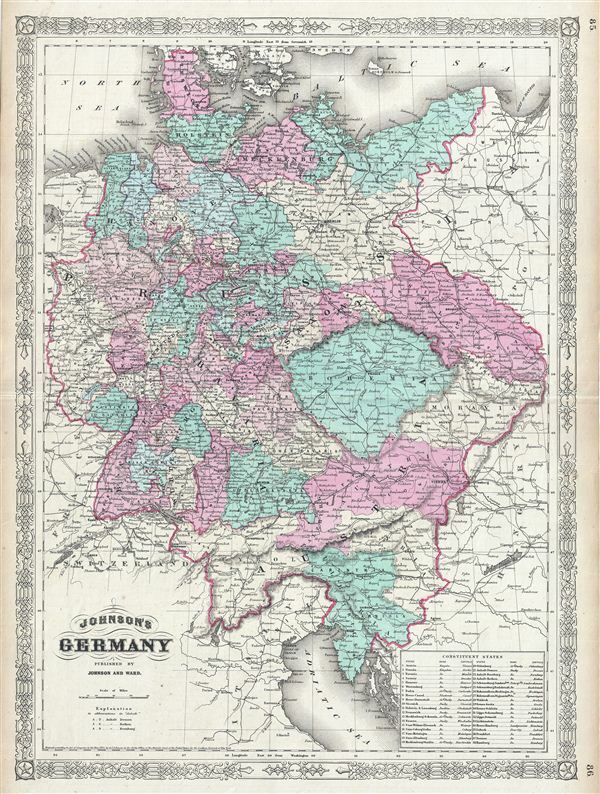 This is a beautiful example of Johnson and Ward's 1865 map of Germany. It covers Germany from Baltic Sea to the Adriatic Sea. The lower right quadrant features a list of the Constituent States. The German Confederation, created in 1814, acted as a buffer zone between Austria and Prussia, its two largest and most powerful member states. Nonetheless the rivalry between the two powerful states increased until the breakout of the Austro-Prussian War. Prussia won the Austro-Prussian War in 1866, ultimately leading to the collapse of the German Confederation and the creation of the North German Confederation. A few years later, in 1871, most of the former Confederation states were folded into the newly proclaimed German empire. Various towns, cities, rivers and several other topographical features are noted with relief shown by hachure. It features the fretwork style border common to Johnson's atlas work from 1864 to 1869. Published by A. J. Johnson and Ward as plate nos. 85 and 86 in the 1865 edition of Johnson's New Illustrated Family Atlas. This is the first edition of the Johnson Atlas to be attributed to Johnson exclusively. Very good. Minor wear along original centerfold. Text on verso. Minor foxing and overall toning. Rumsey 0535.053. Philips (atlases) 4345.